Cape Daisies are easy-to-grow plants that make a wonderful display of colour in mid to late summer. 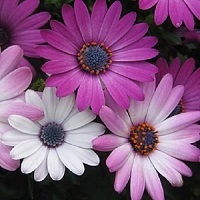 Osteospermum ecklonis is grown from seed in spring or autumn. 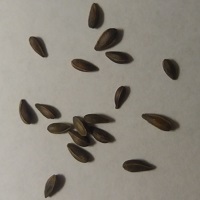 Sow the seeds in a tray or small pots of seed or multi-purpose compost, keep at 16 - 21 degrees Celcius and germination takes 2-3 weeks. 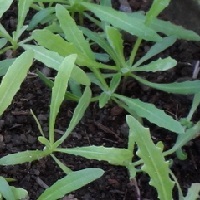 Once the seedlings are established, pinch out the growing tips for a bushier plant, as can be seen in the small plant below. 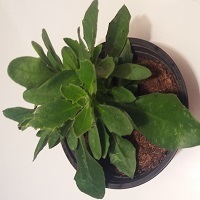 Plants are frost tender and mostly grown as annuals in the UK, but they are natural perennials and will grow and flower for many years in warmer UK or Mediterranean gardens or if sheltered in a greenhouse or indoors over winter. They come originally from a small area near Port Elizabeth in South Africa and are seen growing in sandy soils and full sun. They are drought tolerant once established and make good pot plants. 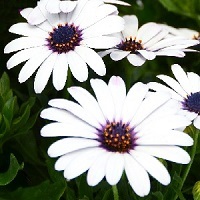 The original species flowers in white with dark blue centres and plants grow to about 100cm in height. A popular alternative is 'Ballade Mixed' with a range of pink and white flowers, and a more compact 20-30cm in height. 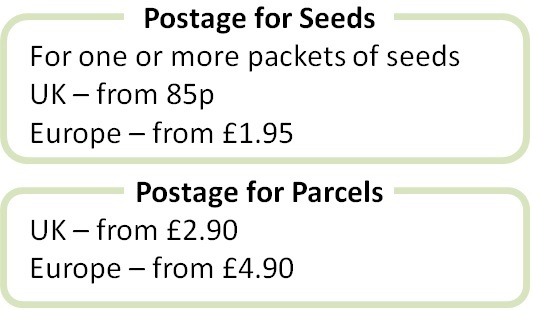 Both are grown successfully from seed.